Although the ball for preventing slipping was only on one side, unexpectedly it was not backed up and it seems to be quite easy to use. This review is about item#08744364. I am using it without problems. There was no sense of incongruity in particular. This price is profitable. I bought the same size as before, but I purchased the same size because I was struggling to use it. The result was a price that did not change, but it was much better. This can be used. This review is about item#8744364. Currently, it is enough to withstand use. This review is about item#8744355. I am using it for maintenance of farm equipment. I bought it at the same time with a socket of a big size which I rarely use. It was good as I could purchase it cheaply. There is no problem in use! It can be used normally. This review is about item#08744373. I am attaching auxiliary equipment of a car as a hobby, but this time when purchasing an oil temperature gauge / oil pressure gauge I bought it to insert a deep socket of 26 side width 26. This horizontally opposed engine was surrounded by the exhaust manifold where the oil element was installed, so this long extension bar was indispensable. Although there is a length, there is also a weight of late but it was a heavyweight feeling rather than including it. The core of the extension bar seems to be coming out firmly, and there was no feeling that it turns while waving while rotating. A gem that I recommend. I bought it because it is cheap because I want a short extension bar. Socket fall prevention is also provided and I am satisfied. This review is about item#08744355. It was sturdy for the price, and it was a product that can be handled even if it is impossible to use. I found out where I was looking for welding to extend it. Function is enough. The price is satisfied cheaply. We use it for the production and repair etc of various machinery. It is easy to use. Because it is a tool it is used as it is. I use it conveniently. I used it for the maintenance of the car. I think that it is really high quality at this price. Used for maintenance of car etc. Can be used without problems OK! is. 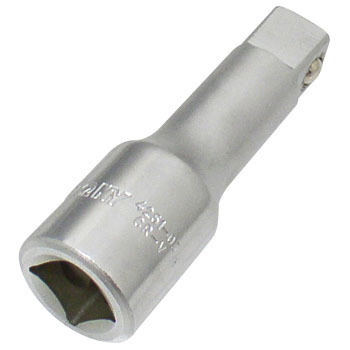 Honda's common tool for the official motorcycle, lock nut wrench (077160020100), with both heads, the position of the 12.7 socket is deep and you can not attach the handle of the socket wrench as it is. It was saved because I could use it by using this extension bar together. I do not have knurled but I think that it is good to be slippery with a satin finish. Personally o Removable socket is light ○ Manufacturers who are hard to remove are irritated when they can not be removed when the hands are slippery with oil or the like. Although it is inexpensive but because it has a thickness of 12.5 sized extensions, I think that I am not worried about the strength in terms of air pressure and electric hand tools, not hand tools. Because the finish is not a mirror surface, it may be easy to get dirty. I already had another thing, but I bought it for T-shaped handles that is troublesome to replace and keep it on.